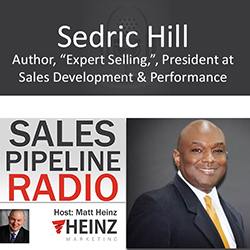 Listen in as we hear from Sedric Hill, Entrepreneur, Author, Thought Leader, Business Coach, Consultant, Sales Expert. Novice and experienced salespeople can both learn from the strategies Hill presents in this book. Additionally, trial lawyers or people in any field requiring the use of persuasive communication will find Hill’s suggestions beneficial. Succes http:// s in selling is not reserved for the experts; with the right tools, anyone can cross the bar to the next level of sales performance. Sedric Hillhas twenty-five years’ experience working in sales, training and development, and senior management. He has written several articles for mailing industry publications. Additionally, he is president and co-founder of Sales Development and Performance, a sales training and consulting firm located in Irvine, California. Publishing on May 3 2016. Expert Selling—ISBN 978-1630477165—has 254 pages and is being sold as a trade paperback for $17.95.